( March 1986) Frank appeared fixated on the sharp bolts of lightning shooting across the night sky followed by the thunder rolling across the Florida swamp near the Gulf of Mexico. I could tell that there was something, a memory of something that caused the same far-away gaze I had seen in others. He slowly opened up to me as a cool breeze sent a chill through me. Frank was a medic in Vietnam. He spent his tour at Lai Khe, South Vietnam in 1968, the year of the infamous TET offensive. 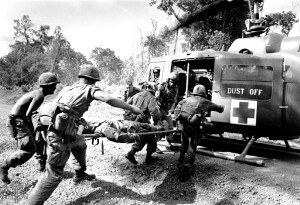 During that time, the Viet Cong and their North Vietnamese allies carried out brutal attacks on numerous civilian and military targets in the south. For American GIs longing to fly home on a Freedom Bird, it was a tour that could not end soon enough. His M.A.S.H unit, now called M.U.S.T., for Mobile Unit Self-contained Transportable, provided medical support for the First Army, the Big Red One. He worked in triage, the place where all incoming wounded are received and labeled according to their wounds. There was one other category, the one most difficult to decide. Those were the critically wounded who would in all likelihood die, but who just might, with special time-consuming care, pull through. No effort was made to save them. There were four doctors at the hospital Frank was stationed at and unlike Hawkeye and B.J., they had very little time to look for a way to relieve the tension. Frank said there was a lieutenant who drove around the base, standing up in a jeep wearing insignia that showed he was an officer. The enemy always looks to kill an officer, given the chance. Some thought he was looking for death by the enemy. The Lt. also had a relationship with a beautiful nurse at the camp and they were very much in love. One day, out on patrol, the Lt. told the lead soldier that he would show him how to walk point. That is the man out front on a patrol. If something happens, the point man is often the first to be taken out. The Lt. moved quickly, carelessly, along the trail. A short time later he tripped a wire and a bouncing Betty, a charge alongside the trail, exploded, throwing another charge up and it exploded, spraying metal fragments out. It took the Lt.’s head off. When they notified the nurse, she went insane. Frank said it was not uncommon for the base to be shelled and rocketed two and three times a night. During Frank’s last month at Lai Khe he got the “short timer shakes,” the fear that as your tour of duty winds down, something will happen and you’ll never make it out alive. Those last few weeks were spent, as much as possible, behind a bunker. That year of tension, broken by periods of terror, made a lasting impression. Months after returning home any loud noise, especially thunder, made him crawl behind the sofa for protection. And years later, thunder brought on a sense of urgency that he should be seeking shelter somewhere.